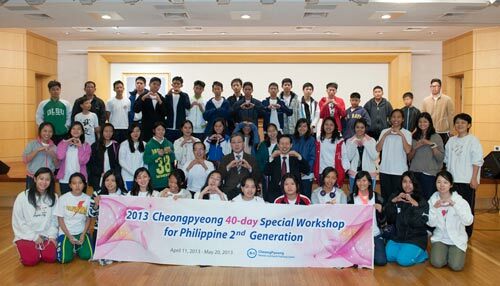 On 3.3 by the heavenly calendar, 1st year of Cheon Il Guk (solar: April 12,2013) the opening ceremony for the '2013 Chung Pyung 40-day Special Workshop for Philippine 2nd Generation' was held at the small hall of Cheonseong Wanglim Palace (Heavenly Palace) with 42 attending 2nd generations from Philippines. Accompanying the blessed children are 3 parental figures and 1 lecturer from Philippines HQs. These members came to Chung Pyung before starting their school to inherit the love and blessing of heavenly parents and True Parents of the Heaven, Earth and Humankind. Most of the children's age is from 13 to 18 years old. Dae Mo Nim wasn't able to attend the opening ceremony because she is holding a Japan Tour which she will be coming back in the evening of this day. Rev. Yeong-ho Ha, President of Chung Pyung Heaven and Earth Training Center, came to officially greet the 2nd generations for their beginning of a special journey. The emcee for the ceremony was Rev. Dong-bae Kim, Lecturer and Manager of Progress Department, Chung Pyung Heaven and Earth Training Center, which was then followed by the welcoming address by Rev. Ha. After his speech, Rev. Ha offered an invocation and ended the opening ceremony with a commemorative photo taking with the members. The 40-day Workshop started from April 11 and will end on May 20. The members are able to attend the '2013 Purification Azalea Festival for the Inheritance of Heavenly Fortune' and many other exciting programs in Chung Pyung.